Will and Kate's World: Isabelle is 10! 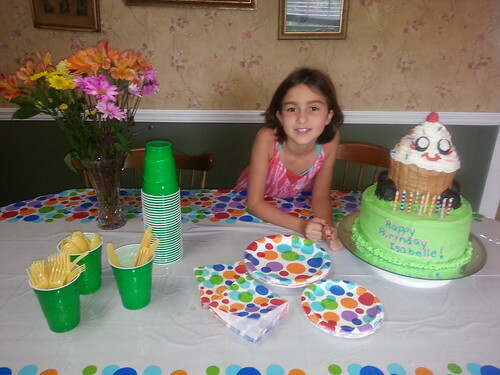 On July 15, 2013 Isabelle turned 10. I can’t believe it has been 10 years since she was born. All the things that have happened and we have been a part of in the last ten years. It think about people who are 100 years old and all of the things that they have seen and done. Then, it just boggles my mind to think about eternity in heaven. Isabelle’s ten years are just a flicker of a thought in that time frame. But how special they have been to us so far. I can’t wait to see how God uses Isabelle’s loving, giving, stubborn, and willing to do what she needs to attitude to further his kingdom. Here she is with her Moshi Monster cake. She had a great day of swimming with friends. Thanks to all who came to celebrate her special day!